EVOK, Good Things Come in Friendly Packaging! In 2013, Cascades commercialized the food packaging called EVOK: Polystyrene foam made in part from recycled content. A first in North America! 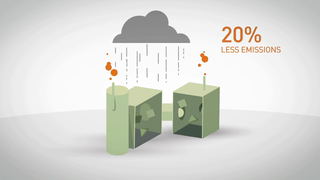 Evok allows a 20% reduction of green gas emissions compared to the polystyrene normally made by Cascades. A product that is even more eco-responsible!